Back in 2007 the newsletter put a cry for help on the front page to continue the newsletter in its current form. The TREAT management committee was going to have to cut costs for its production as the membership fee then of $10 couldn't cover the administrative costs which included the newsletter. That newsletter edition was printed entirely in black and white to reduce costs. Our cry for help was answered by Nigel Tucker through Biotropica, a consulting company he set up when he left the QPWS nursery - which he had managed for 18 years. The newsletter then continued to be published in its present form thanks to Biotropica's sponsorship. At first, Biotropica sponsored all of the newsletter's costs of artwork, printing and posting, but years later we settled on a flat rate of $1000 sponsorship per newsletter and TREAT picked up the remaining costs from its general funds. Biotropica has sponsored us for 10 years and the contribution they've made is substantial. TREAT is most grateful for their help. Now, however, it is time for Biotropica to move on and allow other sponsors to take up the reins of helping. If TREAT can get a regular sponsor that will be great, but we could accept sponsorship of individual newsletter editions. Biotropica had an advertisement on the front page which they could claim as advertising expenses, and something similar would be appropriate for new sponsors unless they wish to remain anonymous. The newsletter in its current printed form was the result of a Natural Heritage Trust grant back in 2000. Its circulation was extended to include the general public and be available at selected outlets such as local libraries, shire offices and schools. Copies are hand delivered to information centres in Atherton, Yungaburra and Malanda, the Atherton library and the Tablelands Regional Council. Complimentary copies to schools, other libraries and information centres, various organisations and individuals are posted. If no sponsorship for the newsletter in its current form is forthcoming we can keep members informed via the internet. We already have an email list for those members wishing to be reminded about plantings and field days etc. The pdf files used for printing the current newsletter are too large to email to members. All newsletter articles are put on TREAT's website in a form which is easy to access. However, many members prefer a hard copy to read even if they have internet access. Articles are sourced to make the newsletter interesting as well as informative. The deadline of a quarterly production for general distribution is an added incentive to print a quality product. If you have ideas, comments or suggestions please contact me or any of the TREAT committee - see contact TREAT. This annual workshop demonstrates how trees can be identified by examining various leaf features. Alan and Maria Gillanders collect a large amount of foliage from their garden and explain these features. TREAT's hand lenses are used to get a closer look at them. The QPWS staff at this time of year have collected plenty of seed and fruit for cleaning and propagation. Peter Snodgrass from QPWS explains the different types and how to sow them, and gives information on their germination and subsequent care. The workshop is held in two sessions separated by a morning tea provided by TREAT. It is a popular workshop and numbers are limited to about 20, so if you wish to attend, please register with either Barbara Lanskey (ph 4091 4468) or the QPWS nursery (ph 4095 3406). 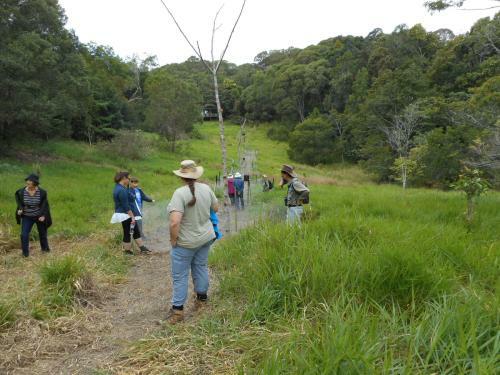 This field day will be held on the coast at Smith's Gap (Maadi for search maps) on Old Tully Rd, south of El Arish, to promote the nationally significant Walter Hill Range Wildlife Corridor which connects habitat from Mission Beach to the Southern Atherton Tablelands. It is being organised by Tony O'Malley of Terrain and will highlight the conservation work being done by landowners and stakeholders in the Walter Hill Range area. He is hoping to get both Cassowary Coast and Tablelands people together to share knowledge about their work at either end of the corridor. Activities, presentations and discussions for the day will include weed management and revegetation methods, ecological and cultural significance of Walter Hill Range, survey results on landholder's values and objectives, funding opportunities and wildlife corridor planning. Tony is hoping for a kindred Tablelands event in the near future to which Cassowary Coast people can come. For background information, see www.terrain.org.au/Projects/Threatened-Species-Ecological-Communities/Mission-Beach (then click on 'Walter Hill Range / Smiths Gap') and http://www.terrain.org.au/News-Resources/Latest-News/Weeds-and-wildlife-draws-a-crowd-to-corridor. This workshop is for anyone wanting to learn about the preparation, planting and maintenance of areas to be revegetated. It is held at the property of the late Ian Freeman, where hole digging and planting can be demonstrated. Mark McCaffrey and Peter Snodgrass have heaps of experience in this field and will share their knowledge and expertise. Following initial talks, TREAT will provide a morning tea. Demonstrations of hole digging and planting will then be at a suitable area where those attending can participate, thereby learning more effectively. Please register with Barbara Lanskey (ph 4091 4468) if you wish to attend. The Freeman property is near Lake Eacham on Cutler Rd off Lake Barrine Rd. Based on the weather bureau's predictions for an early start to a good wet season, another Tropical Tree Day (TTD) planting has been organised and this year it is at Rock Road. It will only go ahead though if there is enough soil moisture at the site from storms prior to the week of the planting. The community has been helping with plantings at Rock Road since 2011 to create a corridor to link a large area of remnant forest at Upper Barron with the Herberton Range National Park. This TTD community planting will be on the property which adjoins the National Park. It was formerly owned by Carolyn and Philip Emms and TREAT helped with plantings there in 2011 and 2013. It is now owned by South Endeavour Trust (SET) and they are working towards having all of the replanted areas together with some old growth forest protected under a Nature Refuge agreement. NQ Land Management Services are in charge of the planting and will be digging holes for the volunteers to plant the trees. School for Field Studies are keen to participate and Tim Hughes of SET is intending to come up from Sydney. Altogether over 3000 trees will be planted but the number planted on the day will depend on how many volunteers turn up. TREAT will provide a barbecue afterwards. Parking is on Rock Road and then we will either walk or be ferried to the planting site. As usual, bring a hat, sunscreen and water, plus gloves and a trowel if you have them. Email Doug Burchill at dcburchill@bigpond.com to be on TREAT's information list for planting updates or check by ringing Angela McCaffrey on 4097 2426. The Christmas party break-up morning tea will be on Friday 16th December. TREAT buys some extra goodies for the occasion from the morning tea money collected during the year. We hope lots of members will come to party and consume what's on offer and QPWS staff from next door always come. The nursery will still be open on Friday 23rd for TREAT members to come to the usual working bee. It is closed for the Christmas - New Year break and working bees start again on 6th January. The mission statement of Rainforest Reserves Australia is to 'purchase, restore and protect rainforest habitat forever'. Rainforest Reserves Australia (RRA) is a Far North Queensland based conservation organisation which was originally established to tender for the care of injured cassowaries housed at the Garners Beach Cassowary Facility. During the Queensland Government's Newman tenure, the Department of Environment and Heritage Protection (EHP) took over the running of this facility from QPWS (Queensland Parks and Wildlife Service). The model that EHP established was to partner with a not-for-profit group which would pay for the rehabilitation of the injured birds within the facility. Rainforest Rescue initially took this on but unfortunately were unable to generate the cash flow needed, and the Queensland Government put the partnership role out to tender. RRA won this bid and now have a formal arrangement with the Queensland Government. At Garners Beach there are currently two orphaned cassowary teenagers, male and female from different locations. 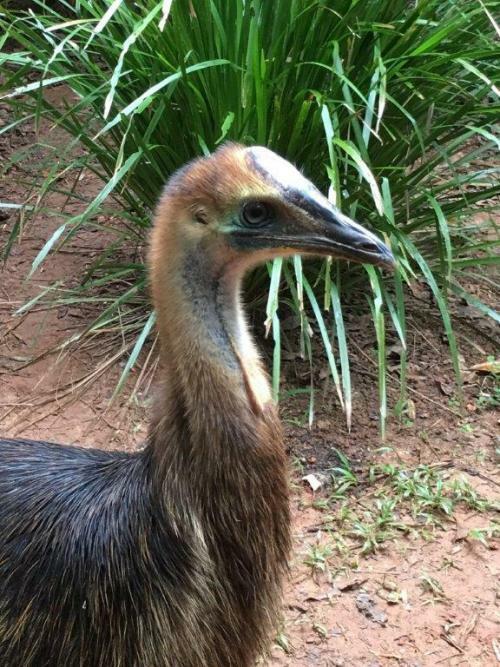 To increase the chances of cassowaries surviving in the wild for the first time, a slow release Tablelands Cassowary Rehabilitation Centre has been established at Barrine Park Nature Refuge. RRA are working towards these two orphaned cassowaries completing their rehabilitation in the natural environment at this refuge prior to their release. RRA are thrilled to be in the process of expanding Barrine Park NR to 100 acres so that this area is protected in perpetuity. Already over 45,000 trees have been planted to connect remnant and restored forest patches to Donaghy's Corridor and the National Park at Lake Barrine; and Donaghy's Corridor connects the National Park at Lake Barrine to Gadgarra and the large Wooroonooran National Park. RRA in partnership with Rainforest Trust are raising funds to plant a further 50,000 trees to connect remnant and restored forest patches on our 'Cedarvale' property to the expanded Barrine Park NR. It is always a concern to cassowary stakeholders that it's a gamble when a young cassowary is released, and many are killed by dogs, cars and pigs. The Tablelands Cassowary Rehabilitation Centre will give researchers the opportunity to monitor these birds in a much larger scale habitat which is free from these threats. It is also important that the birds will not be able to associate humans with food sources, and catapults and other inventions are being developed to supplement the birds' diet with native foods, including veterinarian supplements. This slow release facility is the first of its kind and may allow many cassowary recovery opportunities. As the two birds at the Garners Beach Cassowary Facility are male and female, it may be sensible to eventually release them into a caring Nature Refuge property that backs onto World Heritage forests where cassowaries have become extirpated. A Stewardship Program is being discussed with EHP whereby property owners interested in cassowary conservation who have properties which meet various criteria, can register their interest in having cassowaries released onto their property. Prior to release, minimising threats to cassowaries is of major importance. If cassowaries are still going to be here in 1000 years time, then we need to look outside the square. Rainforest Reserves Australia believes it is going to take the whole wet tropics community to reverse the extinction crisis that the species faces. Dogs are mauling our cassowaries, often leaving them to die a slow and painful death. Rainforest Reserves Australia (www.rainforestreserves.org.au) would love to hear from property owners interested in the proposed Stewardship Program (especially if there are cassowaries on their property) and others interested in becoming a Volunteer for Cassowary Conservation on the Atherton Tablelands. About 30 people came to TREAT's Annual General Meeting on Friday evening 9th September at the Yungaburra Community Hall. Nick had printed illustrated copies of his nursery manager's report and as he wasn't present, Angela read it out. Treasurer Mandy presented her report for the financial year and printed copies were available. Angela read her president's report and it is printed in this newsletter. The election of office bearers for the next year was over quickly as a list of the proposed officers had been on display at the nursery for 2 weeks and no further nominations were received. There are 2 new committee members to replace Ian Freeman (who died) and Alison Eaton (who resigned) and Angela welcomed them to the management team. They are John Hardman and Jo Doecke, both of whom come regularly to Friday mornings and live in the Malanda area. A General Meeting followed the AGM and this was very short as no business was raised. Our speakers for the evening were Piggy and Siggy. They gave us a most entertaining power point presentation about their property at Upper Barron. 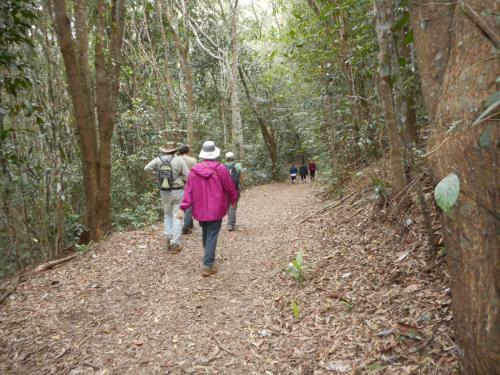 It backs onto the National Park at Mt Hypipamee and contains ecosystems of rainforest, wet sclerophyll and dry sclerophyll. Access has been a nightmare for them but after a few failed attempts at fixing erosion and slippage on the steep hill, they can now get to their shed without mishap. The place was logged just before they bought it and we saw before and after photos of recovery areas. Piggy is keen on wood and put old logs across erosion tracks - so many logs in one photo they looked like a ramp. Their presentation was interspersed with video clips, all the better to watch with Piggy's humour. There was the cassowary blowing bubbles in the water dish (the plumbing inspector) and checking out the shed (the building inspector), the platypus having a bath in the creek, the spider wrapping up her prey (their video clearly showed her taking the silk from her abdomen) and then the black snake which glided up to Piggy's sneakers, sniffed them out and decided they were definitely to be avoided. Piggy was wearing his sneakers! Siggy was on hand with a video when Piggy fell over a bank when lantana gave way and he scrambled to find his hat and shoe. For Piggy and Siggy, their hard work to obtain a Nature Refuge covenant over the property was rewarded on the morning of the AGM when the contracts for their 'Iggies Nature Refuge' arrived in the mail. They brought pink champagne to celebrate with us at supper and I was the lucky one asked to witness their signatures. It was a great evening. I begin this report on a sombre note because 2016 has been a sad and challenging year for TREAT. On five occasions at Friday mornings, I have had to announce the passing of people dear to our hearts. Jill Crawford - who, with husband Don, planted many thousands of trees, hosted several field days and a friend to many TREAT regulars. Rick Speare - New member and Friday morning volunteer tragically killed in a car accident. This sadness came on top of an already challenging year with difficult weather conditions creating a planting season with almost no rain in the first two months followed by windy, drizzly weather making weed control hard. A difficult year indeed but despite this, our work has continued apace at the nursery, plantings, field days, and workshops. Friday mornings at the nursery are a hive of activity with good numbers turning up every week to clean seed, pot up seedlings, wash returned pots, provide morning tea, weed and consolidate seedlings out in the bays. Thank you to all the volunteers concerned. Field days have been held at Noel Preece and Penny van Oosterzee's property at Thiaki Creek in October last year, followed by John and Jenny Rogers' property in Tarzali, led by Andrew Lilley in June, Eleanor Collins and Paul Williams' property at Russell Road in July, and lastly the School for Field Studies' property off the Gillies Highway, led by Amanda Freeman in August. Huge amounts of knowledge and experiences were shared at these well attended events. In most cases afternoon tea was provided by Barbara Lanskey except for School for Field Studies which provided their own catering. There were ten Saturday morning plantings between January and April this year putting about 20,000 trees in the ground, 9,000 of which were TREAT trees. The first planting was 3,500 trees on Ian Freeman's Lake Eacham property. This was substantially more than we would normally plant but because it was a well prepared, gently sloping site and close to the parking, it was relatively easy. Irrigation was started as soon as each section was finished. Next was Phil and Carolyn Emms' at Cedarvale, Lake Barrine where 1,800 trees were planted as infill in the previous year's winter planting. It was a very hot morning so assistance by SFS was very welcome and the trees were watered in by Phil. Next was a field day with a small planting at Bonadio's showcasing the revegetation work over the previous 10 years. Geoff Onus led TREAT and SFS volunteers around the site while the newly planted trees were irrigated. Once again there were three Rock Road plantings this year for South Endeavour Trust with a total of 7,000 trees planted at community plantings and a further 3,500 by CVA volunteers (Conservation Volunteers Australia). This is steep country and TREAT volunteers with SFS have become used to these tough conditions but luckily the weather became cooler with each planting. Watering followed. In between the first and second Rock Road plantings we went to Ringtail Crossing on Kenny Road to plant 2,500 trees. Again conditions were hot and watering was required. Rain finally came just in time for the planting of 1,800 trees at Massey Creek for QPWS. It was lovely planting into wet soil. Next was Frazer Road for Barron Catchment Care with site preparation done by TRC (Tableland Regional Council) and plants grown by TRC. This planting of 1,800 trees was a bit different for TREAT as it was in sclerophyll country and volunteers were boosted by 19 students from the School for International Training. The last planting of the season was on Peterson Creek at De Tournouer's property where 800 trees were planted, watered and frost guarded. Thank you to all the volunteers including CVA, SFS and SIT students as well as those cooking the BBQs. Thanks also goes to Geoff Errey who wrote promotional pieces to advertise many of the plantings and field days published in the local papers. In May, a ceremony was held at the nursery to celebrate Joan and James Wright with a small planting of special trees and shrubs after shared memories from Ngadjon Jii Elder Yvonne Canendo, Alan Gillanders and Fran Herriot. TREAT's usual workshops were held towards the end of last year. The Revegetation workshop, giving general instruction on site preparation, planting and maintenance was at Ian Freeman's property with guidance given by Ian, Mark McCaffrey and Peter Snodgrass. The Tree Identification and Propagation workshop was held at the nursery under the guidance of Alan Gillanders and Peter Snodgrass. Both workshops were organised and catered for by Barbara Lanskey. Thanks to all involved. TREAT continued to supply trees for members' own plantings and these totalled around 7,000 for the year. This year we have benefitted from two teams of Green Army workers provided by funding from the federal government and organised by CVA. Simon Burchill took on the role of supervisor for TREAT taking the teams into older Peterson Creek plantings which were in much need of attention. Thanks go to Simon for this and for organising last year's working field day at Palumbo's property where Creek Cherries and Lomandra were planted on the water's edge with help once again from SFS. TREAT's reliance on QPWS continues. They provide a fabulous spotless nursery, propagation material and a wealth of experience. Thanks to Nick Stevens, Peter Snodgrass, Darren Caulfield, Simon Brown and Caleb Zaicz. Turning now to TREAT's regular activities, quarterly newsletters continue to be issued with a very high standard of informative articles edited and produced by Barbara Lanskey. Thanks to Barbara and all the contributing writers. Once again the newsletter has been sponsored by Biotropica Pty Ltd and we thank Nigel Tucker for his support. The TREAT website continues to be regularly updated by Simon Burchill. Our beautiful display centre at the nursery opens Mondays and Wednesdays thanks to several volunteers including Bob Morrison, Rosemary Pilmer and Margaret Merrill. Plantings are well maintained by our main contractor Mark McCaffrey. We stimulate and enthuse the minds of young with educational activities undertaken by Barbara Lanskey, Beth Smyth and Maria Gillanders. We continue to collate useful data and stats on Peterson Creek thanks to Dave Skelton. We could not function as an organisation without the skills and dedication of our secretary Doug Burchill, treasurer Mandy Bormolini and vice president Ken Schaffer. Lastly the biggest thankyou of all goes to all the committee members who have served this year with such enthusiasm and dedication. I look forward to working with all who have agreed to continue for another year. TREAT has always been keen to educate students about the benefits of tree planting. Visits have been made to most primary schools on the southern tablelands and to some on the coast around Tully. In the past, TREAT used to visit a class, have them visit the nursery, and then do a small planting at the school. In recent years, school curriculums and their costs and insurance concerns have reduced our interaction with the schools, though our programs are still available. If a keen teacher requests some interaction, we organise a suitable program with them. Tablelands National Parks Volunteers (TNPV) run after-school nature based activities for 6-10 year olds, the Lake Eacham Nature Kids Club. In the last few years, TREAT has become part of this program with 'Terrific Trees'. At the nursery we show the children our Display Centre, the trees germinating and growing at the nursery and give them some hands-on experience, cleaning seeds and potting up seedlings. In August, a teacher (Inge) from Malanda High School attended our Terrific Trees activity and wanted her Year 10 class to learn about the nursery. We settled on their coming for an hour at 1.30pm on Monday 12th September and we'd fit in some hands-on activity if possible. Beth and I arrived 1pm at the nursery in plenty of time to talk to QPWS about the seedlings selected for the students to pot up etc. To our dismay, no one was around. I hadn't been able to check with Inge that morning and Beth and I decided we'd go home if no one turned up by 1.45pm. But all was well! QPWS staff Peter and Caleb arrived 1.15pm - they'd been collecting fruits/seeds down at Goldsborough and were held up driving back up the Gillies range. The bus with the students arrived 1.30pm. David Kilpatrick was in charge as Inge had taken sick. By the time the students finished looking at the Display Centre, Peter and Caleb had laid out what they'd collected in the morning and organised some trees to be potted. So the tour of the nursery started with Peter talking about the fruits/seeds and later in the tour he showed the students the different potting mixes used, explaining how some plants didn't like too much fertiliser. Following the tour, the students were given a choice of either potting up one or two plants which they could take home (Sarcotoechia serrata, Syzygium cryptophlebium), or cleaning the fruits/seeds collected (Adenanthera, Hicksbeachia, Dysoxylum, Cycas and others). The class conveniently split into about equal halves. While I helped those students who chose potting, Beth and Caleb engaged the others in seed cleaning. Peter was busy showing David various plants in the nursery as they have a nursery at the school. He also put the potted (and watered) plants into a tray to travel safely back to the school. The students enjoyed themselves and hopefully learnt a lot as well. Beth and I were most grateful to Peter and Caleb for their assistance and we've booked them for all future sessions! As a postscript to the day, the following week (school holidays) Beth and I had organised with Karli of Atherton Outside School Hours Care, to show 5 groups of 9 children around the nursery after they walked there from Lake Eacham. I again arrived at the nursery half an hour early, to find the first group already there! Their bus had been early. There were no hands-on activities this time and they all had their lunch at the nursery's lovely big aluminium tables. Afterwards the 2 younger groups were ushered away for their walk back to the lake, but Peter and Caleb spent time talking to the 3 older groups about the various fruits/seeds which they had laid out again for the children's interest. It was a lovely afternoon for the School for Field Studies (SFS) Open Day on 6th August and many people came to look at the facilities and walk around the property. It was purchased in 1988 and Amanda, the Centre Director, began the afternoon by showing us some interesting aerial maps from 1942 through to 2015. Much of the forest was cleared at different times for access, grazing and lychee orchards, but many of these areas are now growing back and being revegetated, and are used in scientific study. Our walk with the staff and students started at their nursery. It is no longer used to grow trees for revegetation work but is used for research projects. Then we walked through part of an old orchard where lychee trees have never fruited but now stand amongst older and newly planted rainforest trees. Youthful, enthusiastic students clear pockets of weeds (mainly raspberry and lantana) in areas to encourage natural recruitment and to plant trees. Cabins are screened by trees for privacy. We stopped at an open grass area where a research project is studying birds and the fruits they deposit. Replicated enclosures have been set up and the birds drink from a tap rather than an open container which can be fouled by droppings. A track through regrowth forest took us to the western end of the property where some TREAT members helped with a planting in 2013. Further on down the hill was a research area planted in 1993. This site had clearly shown, not surprisingly, that planting maximum diversity for revegetation achieved the best results. We made our way back to the Centre along the main forest track, stopping at another area restored from weeds, and then chatted while consuming the delicious afternoon tea the Centre provided. It was an informative and enjoyable afternoon. This working field day on the afternoon of 11th September at Peterson Creek was scheduled to coincide with 'Bushcare's Major Day Out' activities across the country. It was an opportunity for people to walk through an older TREAT planting and help with some infilling to reduce future grass growth. Simon had collected a lot of Quandong and Black Bean seeds and he spread them between a dozen buckets. There were ten of us and we also had Lomandra plants and a couple of trees in most buckets. The infilling to be done was on De Tournouer's property where TREAT had planted in 2006. To get there we walked upstream from the bridge on Peeramon Road, through TREAT's most recent planting near the creek edge. The trees were looking good. The frost guards were still on but as the weather was heating up, they needed to be removed and stored for next year and the Green Army team were going to do this during the week. The weather was sunny and hot and we were glad to be working in the shade of the trees. The seeds were easy enough to put in small depressions made with our trowels, and then covered with soil, but it wasn't so easy to plant the trees. Despite winter showers and being close to the creek, the soil was very dry and it was hard to dig a hole of any depth, even for the small Lomandra tubes. But we persevered and planted what we had in our buckets, often combining our efforts to dig a hole. We collected water from the creek to give each of our plants a drink and hoped they would survive. At the top end of the planting we crossed the creek and worked on the other side as well. With our buckets empty of plants, although we still had some seeds left, we trekked back for afternoon tea to where Doug had set up a table and gas ring in the shade of trees at the bottom of his property. Simon's fruit and my egg sandwiches quickly disappeared after our energetic efforts. Afterwards, Simon took several of us to see a tree-kangaroo he knew would be in the creek planting further downstream. Although there were some showers the next day which could help the infill plants, it was decided at the TREAT committee meeting a few days later, that next year we would not continue with a 'Major Day Out' planting event. It is simply the wrong time of the year in the tropics. Thanks and congratulations to the new and re-elected committee members for your continued dedication to nature conservation and ensuring TREAT remains a strong and vibrant group. I have no doubt that 2016-2017 will be as productive and successful a year as ever! The following tables are a summary of the nursery annual production figures provided to TREAT for their September Annual General Meeting held in Yungaburra, and include 3 year comparison figures.